This Stainless Steel Rod Holder Is Suitable For Many Boats As It Has A Rust Resistant Finish. 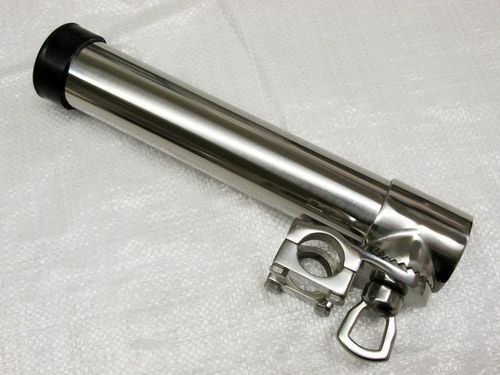 Our Stainless Steel Adjustable Rod Holder Is Great For Boat Uses When Fishing. This Stainless Steel Rod Holder Is Great For Use On Boat Decks For Sport Fishing. Our Stainless Steel Rod Holder Is Great For Boat Use. At SecureFix Direct we have the high quality stainless steel rod holders that you've been looking for. Our items are ideal for securing your fishing rod in place, and they also give you the option of adjusting the angle that it's placed at. Our stainless steel fishing rod holders are extremely popular and they provide the best protection against rust, so you can make the most of it for years to come. Make sure you head straight to SecureFix Direct when you need stainless steel rod holders. We also have stainless steel flush fit rod holders with a rubber cap, providing another option for keeping your rod secure. With our large array of marine goods you can find everything you need right here at SecureFix Direct. We offer free delivery when you purchase our stainless steel rod holders, and we'll strive to process your order as soon as you select one of our items. Don't hesitate any longer and buy from SecureFix Direct today. With our adjustable boat mounts you have everything you need for a fun and enjoyable fishing trip. We only stock the very best items and we're confident that you'll be delighted with whatever purchase you make. If you're having difficulty selecting the correct item for your needs then you can always contact a friendly member of our team, and we'll be more than happy to point you in the right direction and tell you all that you need to know. Why buy stainless steel boat mounts from SecureFix Direct? Our superior fishing rod holders are made from 316 grade stainless steel, and they provide the ultimate resistance to rust. When you want to keep your fishing rod in place there's no better option than to buy from us, so take a look at our specialist equipment and make your selection today. Getting your hands on superior boat mounts has never been easier thanks to SecureFix Direct. If you would like to know more about SecureFix Direct or any of the items in our store, please don't hesitate to get in touch with our dedicated team today.